He looks young. I wonder how old he is? The bride’s outfit is full of symbolism. Her head-wear is called tsuno kakushi (角隠し). It literally means hidden horns and is meant to veil the bride’s feelings of jealousy and selfishness, and show a resolve to be gentle and patient. The tsuno kakushi is a relatively new development. During the Edo Period (1603-1868), brides wore a so called wataboshi, a type of hood which almost completely concealed the bride’s face to all but the the groom. Although largely gone, the wataboshi may still occasionally be seen at some Shinto weddings today. The fan in the bride’s hands symbolizes the widening of happiness into the future. It is usually worn in the obi (the sash around the middle). As it happens, I have a before and after image of the groom. The photo on the left is the photo that the groom used for his omiai (見合い), a process to introduce single individuals to each other so they can measure each other up for possible marriage. During an omiai, a friend or family member usually acts as the nakodo (仲人, go-between) between the two families. The nakodo acts as a bridge between the two families, a liaison and as a guarantor. In this role, he or she works out the details of a marriage, helps to avoid direct confrontations and assists if marital disputes emerge later on, even many years into the marriage. To determine the suitability of potential marriage partners, criteria known as iegara (家柄) are considered. These include education; occupation, income and social standing; religion; and hobbies. 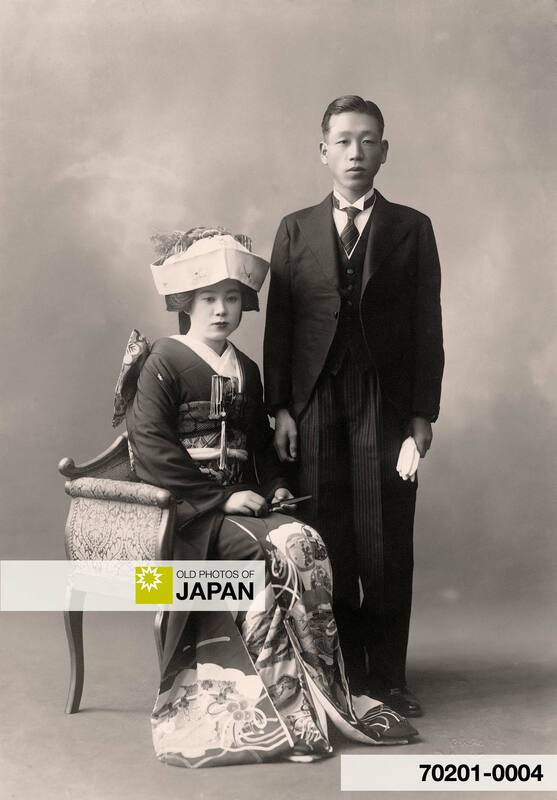 As physical attractiveness also plays a major role, official omiai photographs are exchanged. This image of the groom is such a photo. It is usually presented in beautiful matting and shows the person in a formal manner. They are always professionally produced, snapshots are out of the question. This omiai custom emerged during the 16th century when it was used by Samurai families to form military alliances. It spread to other classes during the Edo Period (1603-1868). 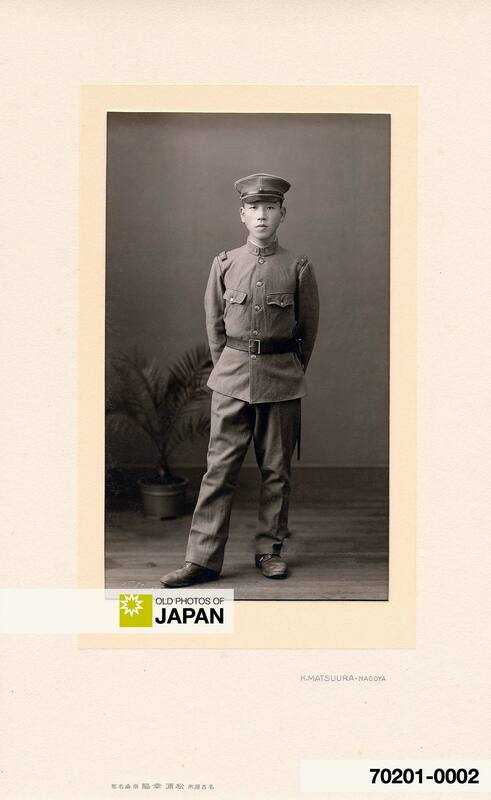 After the end of WWII, omiai lost much of its popularity to love marriages, but it still plays a role in Japanese society and most probably will not fade away for the foreseeable future. You can also licence this image online: 70201-0004 @ MeijiShowa.com. It is difficult to say. Considering the uniform he’s wearing and the age that men married in those days, I’d figure early twenties.